fat. You beautiful and thin." Did you every play a game called 'captain blood' on the c64? 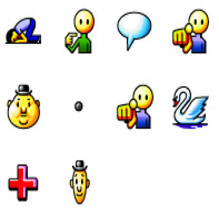 You communicated with aliens using glyphs very much like this. Wow you are completely correct. From the game's wikipedia page: "Communication with aliens occurs via an icon-based interface known as UPCOM. This consists of around 150 icons, each representing a different concept. As each alien race discovered speaks its own language and reacts differently, the player must learn to negotiate using these UPCOM concepts in a style that suits the races." Glorious post from skilled also it should most likely be a wonderful know-find out how to us and thank you a large number for posting this invaluable information with us all.